So the lovely Desiree over at Fake-Eyelashez is having a a contest right now. Shes asked everyone for their best recreation of any of the super awesome CallowLily style looks. This is what I came up with. I did this one in a hurry and submitted it, thinking I would be able to submit another one, but it seems you can only enter one look. :D So Im stuck with what I did the first hour. Serves me right for being too impulsive. What do you guys think? Are you guys going to enter the contest? Which Callowlily portrait is your favorite? If I were to do another look I think I would base it off this portrait. The contest rules are as follows as best as I can tell from what she has posted "Recreate Callowlilly eyes! 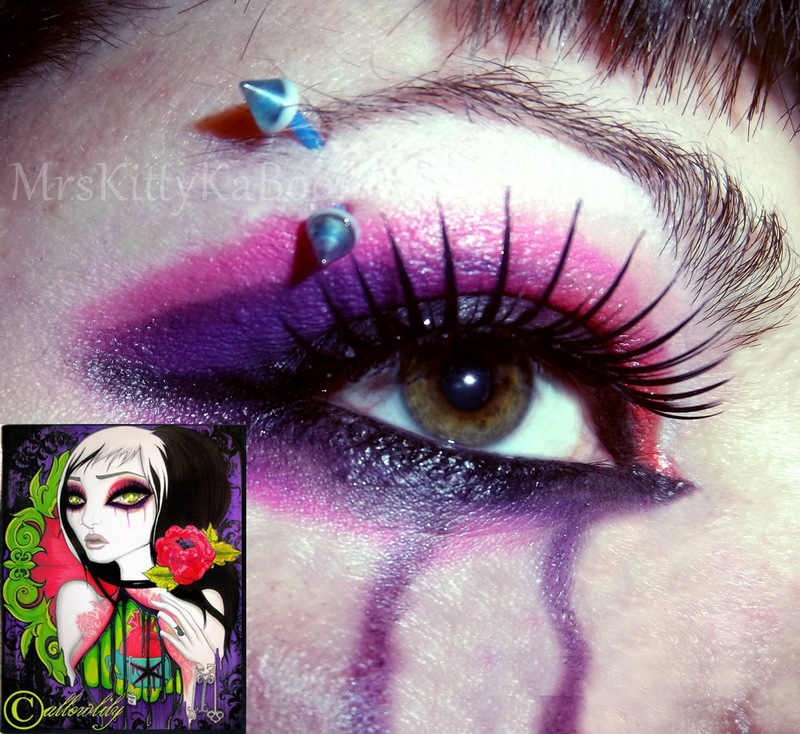 Must post a pic of callowlilly eyes you recreated along with your photo. You post the photo directly to the wall of Fake Eyelashez facebook page.Contest ends March 31 at Midnight. The competition is fierce there really are some AMAZING entries so far and still got a month to go! I think your recreation looks pretty damn close! Looks very nice! BEst of luck! The colours are so... rich and bold! @ Nikki Thanks! I need all the luck I can get! All those other girls have outstanding talent! @ Mandy I really enjoy just how vibrant and rich colors/shadows are now. Its amazing. The majority of this look was created using Hard Candy baked eye shadow duo in #059 ab fab (its half pink & half purple) and used partly foiled (wet application). Well this is just fabulous! What awesome colours and I LOVE the falsies! Just a small request, if I may....I would love to see a picture of your flame point siamese! hehe.Thanks! Sure thing.. Ill post a few photos of him soon! Siamese always look pissed off..I think its the way their eyes sit..but he always looks upset Im taking his photo. lol! Jeeze. Shes still got this contest going on for another week. Might as well shut it down.. no one is going to come close to the girl with 300+ votes. I hate popularity contests. I thought this was about the makeup look .. not about who has the most facebook friends. If I would have known it was going to be judged that way I wouldn't have entered. I refuse to enter anymore "contests" where the likes count as votes. LAME.